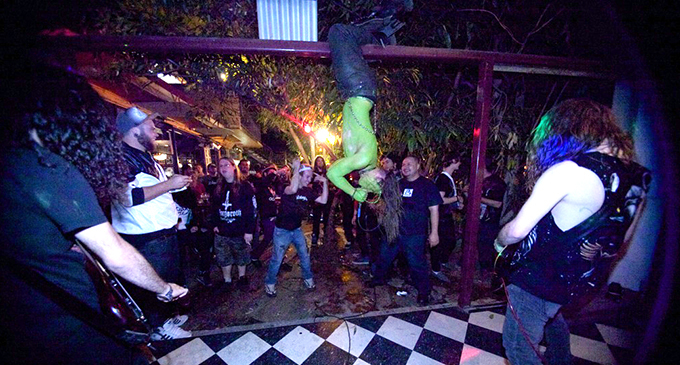 Not for these guys the move to the city, the haircut, the compromise that comes with chasing after airplay: they want to stick with what they believe in, the angry, high energy music of their youth – metal – and its roots in small town isolation and boredom. They are the various talents that make up the three born-in-Alice bands – Miazma, Uncreation and The Horror – and have come together to launch their own label, The Black Wreath. This will be done with a live performance, of course, this Friday – 11.11.11 – at Annie’s Place from 7.30pm. But it will also stream live on the internet in a four camera shoot, edited as it happens and played into metal scene venues interstate – to date, Happy Yess in Darwin, the Squatters Arms in Adelaide and the Brisbane Hotel in Hobart. There’ll be a six track EP, t-shirts and stickers to souvenir, all featuring The Black Wreath artwork. This thorny wreath has its symbolism – the three inter-woven circles representing the three bands, the 12 spikes representing the members of the bands and the whole encompassing all 13 members of the collective. “We are all the 13th member,” says Pirate, who’s been pushed forward as the label’s media contact. At the same time there’s a healthy rivalry between the bands. They all want to out-do one another and that’s pushing them further: “Every band has stepped up to another level,” says Pirate. He speaks compellingly of the group’s commitment to “reignite the local scene”. They’re well on the way, with 500 people turning up to their last gig at Annie’s Place, an 18+ event in mid-September. 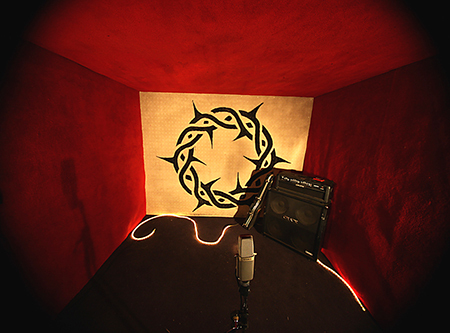 Since then they’ve finished building their studio – a completely soundproof room-within-a-room, made mostly from found and recycled materials and including a control booth behind glass. “There’s that much insulation, carpet and silicon in there, the boys can turn up their amps louder than ever while the guys in the control booth can have a conversation,” says Pirate. It was here that they laid and mixed the tracks for the EP, only resorting to big city expertise for the final mastering. The members threw in what they could in terms of money and combined their talents to get the various jobs done: between them they’re skilled in film-making, production, artwork, building, promotions and of course, music. Why their own label? Why not go with an established metal label? It’s all part of their commitment to the local scene, to not treat it as a mere launch pad, the place where you start before going on to bigger, though not necessarily better things. But part of the strategy is to spark local interest by generating national interest. The fan base is already diverse. Sure, there’s a bunch of young people but there’s also “heaps of hippies” and even “old people” – Pirate speaks with relish of guys with long grey hair who get into the head-banging. “It’s high energy music – anyone can enjoy it,” says Pirate. What about the volume though? Can that be a barrier? “It’s always loud, that’s the way it should be,” he grins. 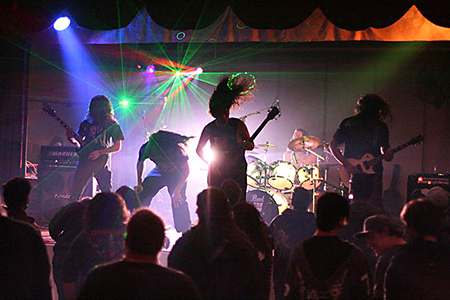 Pictured: Top – Uncreation performing in Alice. Above right – The Black Wreath studio. Photos by OLIVER ECLIPSE. Left – Miazma. Photo courtesy The Black Wreath.